I LOVE March! Spring is here...the leaves are coming back on the trees and the weather is BEAUUUUUUtiful. I can kick the boys outside to play and they are out there for ages while they explore and play and dig. It feels like the start of something new. 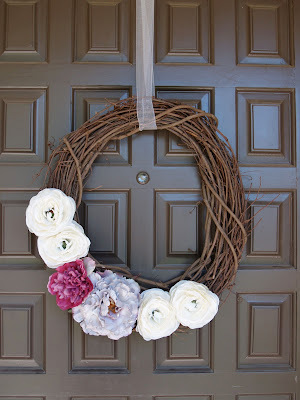 So, I decided two things....we needed a spring wreath for our door and we need to declutter. So this weekend, I put together a grapevine wreath....super simple. Total cost about $8. I got everything at Michaels on sale. Much cheaper than anything I could find premade....and it took about 10 minutes. A few friends have asked if I'm including the kids on the purge....let me re-phrase that...if I'm including them in the PROCESS....the answer is no. Andrew was curious what I was doing with the books and after a brief explanation of "Keep" or "Giveaway", every single book was in the "Keep" pile even though most of them were books he doesn't want to read anymore. I'm all about having the kids help-they help clean all the time....but with this, I want to make quick decisions and get rid of our crap. I'm not sure what the next 3 hotspots will be....I'm hoping my room will be on that list cause that's the one giant dumping ground in our house and I just never seem to get around to tidying it. That is a very nice wreath. When I get back, I will try my hand at making one similar. Mind you when I get back, there will still be much snow on the ground! Cute wreath Mandy! You're so crafty!